The new collection from VONDOM will arouse all your senses and is perfect for patio, pool, and backyard applications. VONDOM create art always looking for the natural beauty of the product endowing them with their own personality. 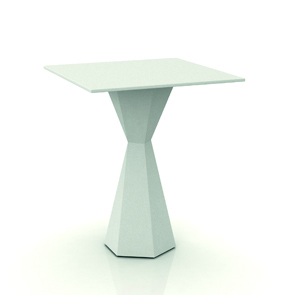 Vondom designs are contemporary & avant-garde. These items will become an integral part of your domestic scenario. Each pieces is perfectly balanced between simple lines, contemporary design, & sophisticated finish options. VONDOM supports one of the World's most complete outdoor furniture collections and is manufactured by rotational molding. This manufacturing technique allows us to create high quality products in a wide range of shapes & colors, making them unique pieces of modern furniture. VONDOM encourages you to enjoy your time by decorating your domestic spaces and illustrate your life with a variety of designs, colors, and shapes. Experience the ultimate in fashion, style, and design via Vondom. VONDOM is born with the anxiety and inquietude by creating a new form of understanding the world of indoor and outdoor decoration.One of the most innovator process in the decoration field at the moment , rotational molding, is the main employed technology for the development of the new products, as well as the employment of textiles, metals, glass... If we add the experience to technical level and the creative capacity, the result is an initiative with great value, this is without doubt to be VONDOM. In VONDOM we work to create art, always in search of the natural beauty of the product, giving them their own personality, always bearing in mind the vanguard of contemporary design, simply and balance. In VONDOM, faithful to our philosophy endowing to our designs of its characteristic features that are the design of vanguard for indoor and outdoor, the quality of its materials that permits them to bear the most extreme climatic conditions and the sustainability, since we only utilize material 100% recyclable for our production. The products VONDOM are designed by the best designers in the world, since as them, in VONDOM we are some impassioned of the design, the art, the functionality and the sustainability. That anxiety and its capacity of development, does that VONDOM creates new products continuously, creations that cause to feel and to live serenely favoring the human contact and the friendly conversation. In VONDOM we compromise with the society to create objects of design, efficient, pleasant and ecological, for offer our clients a more pleasant life and a more sustainable world. Our products are born with a distinction which makes them special and unique to the rest. We hope you enjoy them.